The recent South China Sea arbitration, being a landmark case, has cited the Larsen v. Hawaiian Kingdom case as one of the international precedents on “indispensable third parties” along with the Monetary Gold Removed from Rome in 1943 case and East Timor case in its Arbitral Award on Jurisdiction and Admissibility (paragraph 181). This is a significant achievement for the Hawaiian Kingdom in international law. 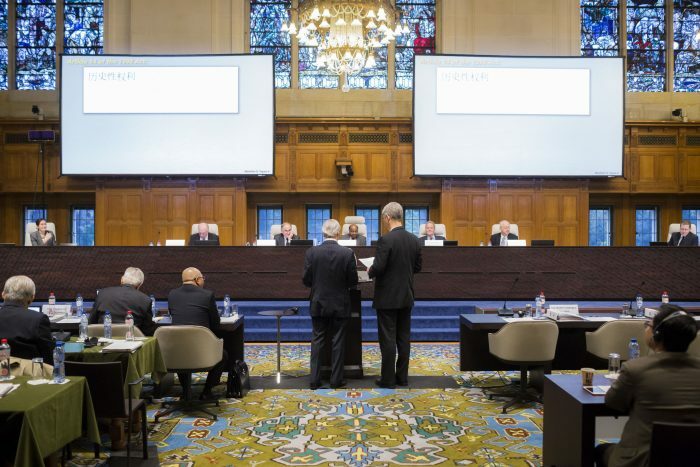 On July 12, 2016, the Arbitral Tribunal in the South China Sea Arbitration (The Republic of the Philippines v. the People’s Republic of China), established under the auspices of the Permanent Court of Arbitration (PCA), issued its decision in The Hague, Netherlands. The decision found that China’s claims over manmade islands in the South China Sea have no legal basis. Its decision was based on the definition of an “island” under the United Nations Convention on the Law of the Sea (1982) (Convention). At first glance, it would appear that China contested the jurisdiction of the Arbitral Tribunal in a Position Paper it drafted on December 7, 2014, and on this basis refused to participate in the proceedings held at the PCA in The Hague, Netherlands. So how is it possible that the Arbitral Tribunal pronounces a ruling against China when it hasn’t participated in the arbitration? The simple answer is that the Arbitral Tribunal could issue a ruling because China “did” participate in the proceedings and has consented to PCA’s authority to establish the Tribunal by virtue of the UN Convention on the Law of the Sea (1982). As noted in the PCA’s press release, the PCA currently has 12 other cases established under Annex VII of the Law of the Sea Convention. China is a State party to the UN Convention on the Law of the Sea, and arbitration is recognized as a means to settle disputes under Annex VII. What is not commonly understood is that there are two matters of jurisdiction in cases that come before the PCA. The first is “institutional jurisdiction” of the PCA, and the second is “subject matter jurisdiction” of the Arbitral Tribunal over the particular dispute. 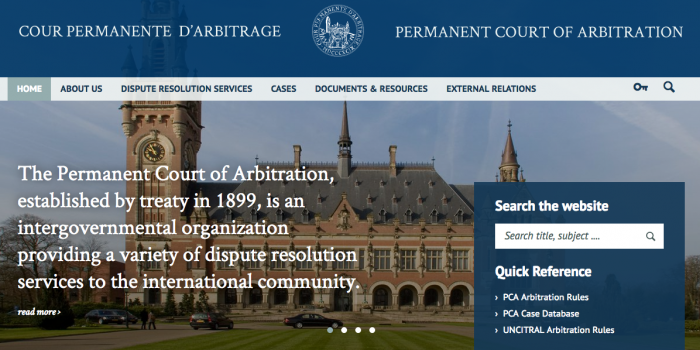 As an intergovernmental organization established under the 1899 Hague Convention, I, and the 1907 Hague Convention, I, the PCA facilitates the creation of ad hoc Arbitral Tribunals to settle disputes between two or more States (interstate), between a State and an international organization, between two or more international organizations, between a State and a private entity, or between an international organization and a private entity (United Nations Dispute Settlement, Permanent Court of Arbitration, p. 15). Disputes must be “international” and not “municipal,” which are disputes that go before national courts of States and not international courts or tribunals. An explanation of the PCA’s institutional jurisdiction is also provided in the South China Sea case press release. On page 3 the press release the PCA states, “The Permanent Court of Arbitration is an intergovernmental organization established by the 1899 Hague Convention on the Pacific Settlement of International Disputes. The PCA has 121 Members States. Headquartered at the Peace Palace in The Hague, the Netherlands, the PCA facilitates arbitration, conciliation, fact-finding, and other dispute resolution proceedings among various combinations of States, State entities, intergovernmental organizations, and private parties.” China became a member State of the PCA on Nov. 21, 1904, and the Philippines on Sep. 12, 2010. The “institutional jurisdiction” was satisfied by the PCA because both the Philippines and China are States, which makes it an interstate arbitration, and both are parties to the UN Convention on the Law of the Sea, which under Annex VII provides for arbitration of disputes under the Convention. It was under this provision that the PCA could establish the Arbitral Tribunal. In other words, the Tribunal was going to determine in accordance with the UN Convention on the Law of the Sea, whether or not the reefs and rocks in the South China Sea constitute the definition of islands as defined under the Convention, which would determine whether or not it had a territorial sea of 12 miles and an EEZ (Exclusive Economic Zone) of 200 miles. It would not be determining matters of sovereignty over the islands. If they weren’t islands, but rather reefs or rocks, then China’s claims to a territorial sea and an EEZ would become irrelevant. The Arbitral Award determined that they were not islands as defined under the UN Convention on the Law of the Sea. In the Larsen case, the PCA exercised its “institutional jurisdiction” when it convened the Arbitral Tribunal, because it recognized that the Hawaiian Kingdom is a “State” in a dispute with a Hawaiian subject who was a “private entity.” Like the South China Sea case, once the Tribunal was convened, it had to address whether or not it had subject matter jurisdiction over the dispute between Larsen and the Hawaiian Kingdom, because of the fact that the United States was not a party. What was at the center of the dispute was the unlawful imposition of American municipal laws within the territory of the Hawaiian Kingdom. The Tribunal was not established to determine whether or not the Hawaiian Kingdom exists as a “State,” which was already recognized by the PCA prior to establishing the Tribunal under its mandate of ensuring it had “institutional jurisdiction” in the first place. According to the American Journal of International Law (vol. 95, p. 928), “At the center of the PCA proceeding was…that the Hawaiian Kingdom continues to exist and that the Hawaiian Council of Regency (representing the Hawaiian Kingdom) is legally responsible under international law for the protection of Hawaiian subjects, including the claimant. In other words, the Hawaiian Kingdom was legally obligated to protect Larsen from the United States’ ‘unlawful imposition [over him] of [its] municipal laws’ through its political subdivision, the State of Hawaii. As a result of this responsibility, Larsen submitted, the Hawaiian Council of Regency should be liable for any international law violations that the United States committed against him.” If the Hawaiian Kingdom did not exist as a State, the PCA would not have established the Arbitral Tribunal to address the dispute. In these proceedings, however, the Council of Regency was attempting to get the Tribunal to pronounce the existence of the Hawaiian Kingdom and even try to see if the Tribunal could issue some interim measures of protection. This was deliberately done to show that the Hawaiian Kingdom was taking affirmative steps, even during the proceedings, to do what it could in addressing the unlawful imposition of American municipal laws within Hawaiian territory, which led to Larsen’s unfair criminal trial and subsequent incarceration. In the Arbitral Award, the Tribunal concluded that the United States was an indispensable third party. In paragraph 12.5, the Tribunal explained, “It follows that the Tribunal cannot determine whether the [Hawaiian Kingdom] has failed to discharge its obligation towards [Lance Larsen] without ruling on the legality of the acts of the United States of America. Yet that is precisely what the Monetary Gold principle precludes the Tribunal from doing. As the International Court of Justice explained in the East Timor case, ‘the Court could not rule on the lawfulness of the conduct of a State when its judgment would imply an evaluation of the lawfulness of the conduct of another State which is not a party to the case. '” It is clear that the Tribunal recognized the Hawaiian Kingdom as a “State” and the lawfulness of its conduct, and the United States as a “third State” and the lawfulness of its conduct. This entry was posted in Education, International Law by Hawaiian Kingdom. Bookmark the permalink. I am having trouble understanding this from the Larson point of view… what was and is the outcome of protesting the u.s. court system that is telling me that I must appear for not following their phoney rules reguarding boat registration and use of the ocean and harbors…. I seek to be recognized as a Hawaiian Subject NOT a slave to the illegal state. I am a Kupuna Kahu and have been treated badly all my life by this injustice system but took all the bum raps until now. I can no longer in good conscious go along with the “rules” now that the truth of our beautiful nation is finally coming to light. I pule for peace for all and solutions to be forthcoming very, very soon! The fact that this international body would reference the Larsen case–and by extension, the case of the Hawaiian Kingdom in the 21st century–means that 1) the HK is legitimized as a sovereign state no matter what the US says, and 2) the HK in turn helps legitimize international law. Just as the US refuses to support the HK’s sovereignty, so China is doing the same in the south China sea with regards to the Philippines and other neighboring countries. The US loves to wag the finger at China for human rights violations, but does the same itself with regards to the HK. Both the US and China therefore refuse to acknowledge the authority of the Tribunal because its rulings do not favor them. That is simply playing dirty for the sake of self-interest. The US and China are doing the same thing Russia did with regards to Crimea in violating the sovereignty of Ukraine. All three counties are hypocrites for wagging the finger at each other for each other’s violations of international law but will pick and choose when they themselves violate international law and would prefer that the rest of the world not complain. Ridiculous! The point is: Mahalo for contributing to the discussion. I believe the strategy for the acting HK gov’t going to the PCA in the first place was to have the PCA qualify the continued existence of the HK as a State. Which in turn has provided case references such as this to help expose our occupation. The U.S. has claimed the PCA is the final authority and all States (China) should abide by the PCA’s ruling. They didn’t expect it to backfire in that PCA’s ruling actually exposes the U.S.’s own violation of international law regarding Hawaii. This could be one reason the U.S. has never ratified the UNCLS nor became a member to the PCA. Just saying. It should be underscored that the US is in fact a member state of the Permanent Court of Arbitration (PCA), merely one of the many nations at the beginning of the 20th century that saw the need and value of an international judicial institution that could effectively be a peaceful alternative to settling differences between states. Notwithstanding this fact, however, upon being formally invited by Larsen and the Acting Government of the Hawaiian Kingdom to participate in the arbitration initiated, the US declined. As a consequence, the PCA found that the arbitration could not continue given that the US was an indispensable third party. Of significant importance, however, the PCA did provide judicial notification of the continued existence of the Hawaiian KIngdom as a member of the international family of nations by citing the necessity of the Acting Government to represent the interests of the citizens and government of the Kingdom in the 21st century. This was and has been, up to this point in time, the most significant achievement in all of our years as an occupied state. It effectively puts the US, State of Hawaii and other violators on notice that the vitality and fulfillment of the Hawaii Kingdom is inevitable. In light of the PCAʻs findings as expressed in the Larsen Case which is now embodied in the PCA repository of decisions, had the US agreed to be a third party to the arbitration, the US would have failed to meet the burden of proof that Hawaii was transferred to the US pursuant to a treaty of cession with the Hawaiian Kingdom. Ultimately, along with the additional chain of conspiratorial events employed through the unfolding of Spanish American War, and more that a century of its illegal occupation of the Kingdom, the US would have been subject to every conceivable war crime and corrective measure. Clearly, the US and their co-conspirators will continue to create diversions such as those proposed by the Department of Interior, OHA, John Waihee, President Obama, and Governor Ige. As such, it is imperative that our Aliʻi Trusts, all of which were established to ensure the vitality of our people and their Kingdom, understand fully the rule of law, the implications of international law, and their inherent responsibility and obligation to our people, our alii and our Kingdom. I am not in any way any expert of international law. However, my take on what I began to follow two years ago is the astonishing fact that after more than 100 years, the Larsen Case resuscitated a legal strategy employed by Queen Liliuokalani to restore the government of the Hawaiian kingdom that was overthrown illegally by the US in 1893. The Queen executed a treaty with the President of the US, passing on to him the temporary reigns of her government, subject to his investigation of the role his government played in a conspiracy to overthrow the Kingdom. In the event that such a conspiracy was indeed validated, the President agreed to return the reigns of government to the Queen, who in turn would pardon, and not prosecute those who committed treason. Needless to say, the US did find itself to have played a principal role in the overthrow, but driven by it imperialistic aspirations to dominate the Asian Pacific region of the world, the Hawaiian Islands had become a national security imperative. Without a doubt, for those who recognized that no one in the Islands could compel the US under any circumstance to be held accountable to the rule of law, a legal axiom we all have embraced as biblical, an international venue was ultimately the only path in our history yet to be pursued. Thus, the recognition and findings of the PCA that the Hawaiian Kingdom continues to exist in the 21st century is linked directly to the last international transaction consummated in the Islands between Queen Liliuokalani and a US consulate representative of the President in 1893. As such, the PCA was compelled as part of its duty under the rule of law, to formally recognize the entity representing the interests and sovereignty of Hawaiian Kingdom as the “Acting Government of the Hawaiian Kingdom”. This as you know is unprecedented for everyone in the Islands, not easily understood, and for many, self serving. Obviously, the “Acting Government of the Hawaiian Kingdom” is a necessity of the rule of law arising from the world oldest international judicial institution that has in effect recognized Hawaiian Islands as a nation illegally occupied by the US continually for more than a century — an unprecedented circumstance. The challenge that our people face in accepting the notion of the Acting Government is grounded in the denationalization policies of the US that were imposed on the Kingdomʻs public school system, throughout every appendage of government, and every community as many of our kupuna have attested to over the years. In this regard, the greater challenge that we face can only be overcome by the “truth”. Merely as a snapshot that needs to be unveiled soon, many will be shocked to discover the role Kamehameha Schools played in the dissolution of Hawaiian civilization, language, culture and government of the Kingdom. It is this nature of the truth that will lend to a greater appreciation of what some Kamehameha School graduates have done to make things pono. Hypothetically, if the HK state was to become a party to UNCLS and a state violated it’s rights pursuant to UNCLS it could file a complaint against that state and prevail if that state is a member to the PCA and signatory to UNCLS. Just saying, hypothetically.